LA Cops has some cool ideas, but the frustratingly shoddy execution works completely at odds with the experience the game is trying to create. On a piece of coffee-stained, donut-crumbed paper, LA Cops should be great. It’s an unashamed 3D clone of violent top-down finesse-shooter, Hotline Miami, but its rich ‘70s era Los Angeles vibe coats it with a much more lighthearted sense of humour. Where Dennaton’s modern classic arguably delves into the depths of a dark psyche, LA Cops just cracks a corny one-liner. A sense of humour and strong grasp of an era is a great thing, and Cops’ aesthetic is the best thing it’s got going, even when the writing frequently falls short of the mark. This is a simple but colourful game, laced with a funky distorted guitar soundtrack that sounds like it’s never going to get old. It does—and disappointingly quickly—but the partners-in-crime-prevention banter during short cutscenes punctuates the soundtrack with a much needed rest. The game’s real unique shtick is a reliance on two playable characters during each level. 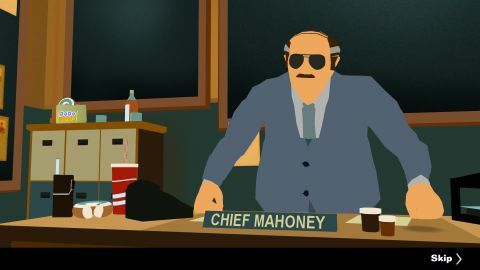 Each playable cop is a classic ‘70s stereotype with over the top hair-dos, overdone accents, audacious sideburns and textbook era surnames like Kowalski. You can switch between them as you go, and the intention is clearly a focus on strategy, using your duo to invent interesting ways to double-team unsuspecting drug lords and low-level goons. This is all well and good, but LA Cops’ feels shoddy and clunky in the hands. Movement isn’t nearly as smooth as it should be, with controller settings in need of tweaking before you can even use the right thumbstick to aim. On mouse and keyboard it’s just about fine, but running and strafing still doesn’t feel fluid. And who am I kidding? Fine is just not good enough for something that imitates one of the most precise twin-stick shooters of the last few years. While Hotline gives everything in its world a sense of solidity, LA Cops feels like it’s floating. Oh, and the menu systems are absolutely terrible. The rest is pretty familiar stuff. You burst into isolated levels to massacre a bunch of bad guys—hostage-takers, drug dealers, and everything in between. You shoot first, ask questions later, which is obviously the best way to enforce law in a world as seedy as ‘70s Los Angeles. You have a melee attack which doubles up as a way to arrest bad-guys, and going for a non-lethal run it adds stealth into the mix, requiring you to sneak up behind your foes and whack the cuffs on ‘em. You’ll get a higher score reward for doing this, but you also remove the most satisfying method of interaction that you have with the game’s world—guns and, more importantly, the shooting of guns. That unique tactical element falls apart, too. I would often try place one of my cops in interesting positions on the map, only to end up getting bored and just brute forcing my way through because it was the most fun way to play. Why spend so much time slowly moving through the levels as a unit when you can more easily just use one cop? Rather than feeling in control of a badass dude-duo, I felt like I just had a lifeline I could rely on if things went south. There’s some cool depth to the cops themselves, with different skill trees you can notch up as you earn XP, but doing just exposes game’s imbalanced difficulty. After spending a silly amount of time trying to get through the game’s second level - a wide open Bauhaus - which was punishingly tough, I ended up replaying introductory Donut Store level a couple more times. I assumed I was just not au fait enough with the game’s tactical shooting elements to best its second stage. Turns out, I was wrong. After a few repeats of the first level I levelled up my favourite cops Kowalski and Katsuo so they had larger clips, could move faster and deal more damage. The game then became almost too easy for the next few stages, and it just exacerbated the problem of relying on that second cop as a lifeline rather than playing strategically. The killing blow to LA Cops is that it never gets under your skin. It never becomes compulsive. With Hotline Miami, a game I’ve mentioned far too many times in this review but to be honest it’s LA Cops’ own fault, playing became instinctive and dying just means you try again with the adrenaline streaking through your veins. With LA Cops, death feels like a full-stop. I never had that ‘just one more try’ moment, and I think that’s the biggest criticism I can give a game like this.